Background: Women of reproductive age suffer from menses-associated health problems such as premenstrual symptoms, menstrual pain, and irregular menstrual cycles. Research has proved that premenstrual syndrome (PMS) is a psychophysiological and a stress-induced disorder and that stress is a cause of symptoms of PMS. 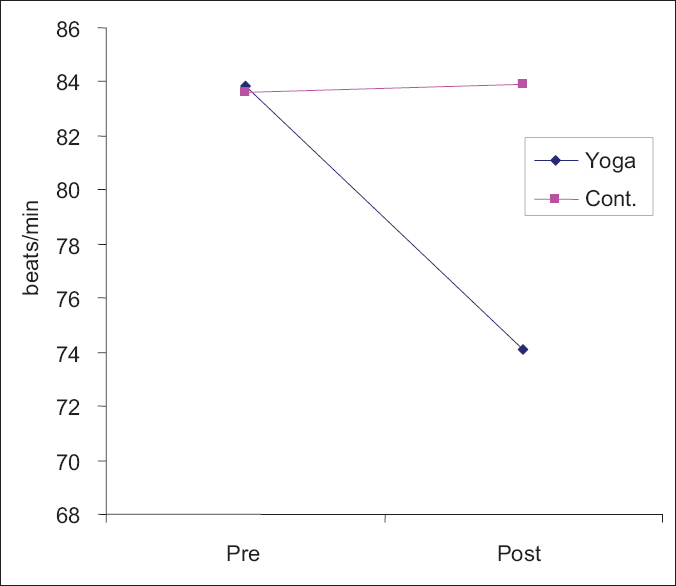 Objective: This controlled experiment was conducted with a view to examine the effect of full course of yoga training (suggested by Swami Kuvalayananda) on psychophysiological responses across menstrual cycle in low fit college women. Methods: A total of 55 low fit college women, aged 20–30 years, with problems in menstrual cycle, volunteered in this study and were divided randomly into two groups, namely, yoga group (n1 = 27) and control group (n2 = 28). At the baseline and after completion of 12 weeks of yoga training, both the groups were assessed for menstrual status, pain tolerance, resting pulse rate, and blood pressure (systolic and diastolic) using standard tools. The yoga group practiced a set of full course of yoga for 1 h daily in the morning (6:30–7:30), 6 days in a week (except Sundays and holidays), for a total period of 12 weeks, whereas the control group did not participate in the said yoga program but were involved in some recreational activities and/or library reading during the tenure of experiment. Results: The result of factorial ANOVA followed by Scheffe's post hoc test indicates that yoga training could bring down pulse rate (CD = 0.43, p < 0.05) and blood pressure (CD = 0.47, p < 0.01) at a normal range, whereas it could bring a statistically significant improvement in the symptoms of menstrual problems (CD = 0.45, p < 0.01) and pain tolerance ability (CD = 0.40, p < 0.01). 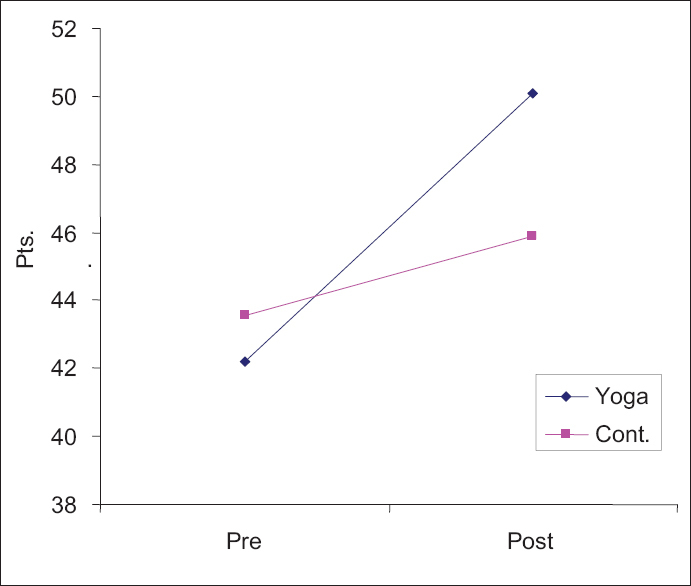 Conclusion: Yoga training could contribute to improvement in the psychophysiological responses across menstrual cycle among the low fit college women. The result on the symptoms of menstruation problems (points) of the low fit college women indicates that the mean scores (standard deviation [SD]) of yoga group (pre: 1 and post: 2) and control group (pre: 3 and post: 4) were 32.67 (5.64), 26.55 (6.87), 31.80 (6.29) and 30.36 (4.64), respectively, which showed that the baseline data on menstruation problems of the participants were much higher [Table 1]. Appearance of high-intensity suffering from menstrual problems may be due to uncontrolled activities of cortisol and growth hormones that might have led to psychophysiological stress during the menstrual cycle (Abplanalp et al., 1977). However, result of Scheffe's post hoc test revealed that the yoga training could significantly reduce the symptoms of menstruation cycle (CD =0.56, p < 0.01), whereas the participants of control group could not reduce these symptoms (CD =0.11, p > 0.05). The result, in turn, infers that yoga group showed significant superiority over the controlled one in reducing the symptoms of menstruation cycle (CD =0.45, p < 0.01) [Table 2]. The result obtained from this investigation seems to be logical because relaxation component of yoga perhaps contributed to alleviate PMS symptoms (Goodale, Domar, & Benson, 1990). Moreover, yoga perhaps controlled stress syndrome and levels of cortisol as well as dehydroepiandrosterone sulfate (DHEAS) and melatonin, which might have helped to minimize PMS of the college women and inspired them to live a quality life with enhanced favorable mood (Carlson, Speca, Patel, & Goodey, 2004). Thus, considering this mechanism, the selected yoga practices might have reversed the symptoms of menstruation cycle of low fit college women [Figure 1]. This suggests that yoga has a significant role in controlling the symptoms of menstruation problems during menstruation cycle. Since the symptoms of pain during the phases of menstruation cycle are generally evident in most of the women, especially who suffer from menstruation problems, they need to improve pain tolerance ability instead of using modern medicine frequently. The result of this investigation indicates that pain tolerance ability (points) of low fit college women (with menstruation problems) in yoga group (pre: 1 and post: 2) and control group (pre: 3 and post: 4) were 41.89 (9.72), 49.70 (10.33), 44.37 (8.31), and 47.87 (7.29), respectively [Table 1], which indicates that the baseline data on pain tolerance ability of the low fit women were very poor. In fact, earlier research also evidenced the similar baseline data on poor tolerance ability of the women with disturbed menstrual cycle (McCracken, 1998). 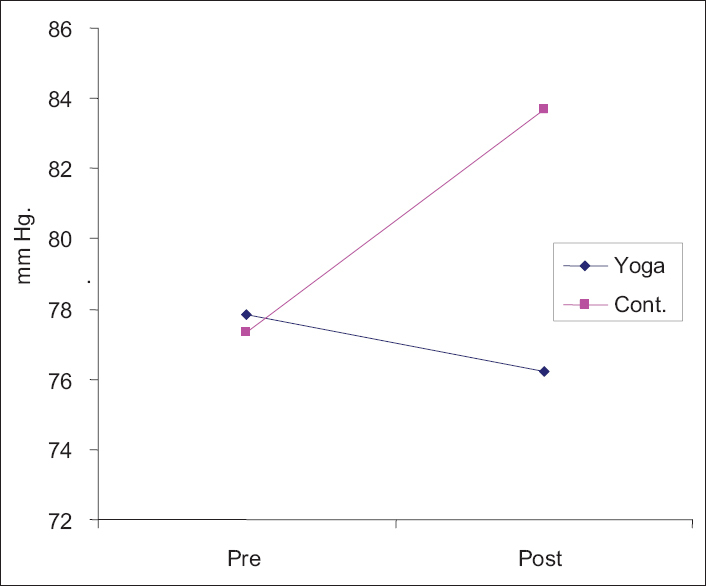 The result of Scheffe's post hoc test revealed that the yoga training could significantly improve the symptoms of pain tolerance ability (CD = 0.52, p < 0.01), whereas the participants of control group could not improve the same (CD = 0.09, p > 0.05). The result further infers that yoga group showed significant superiority over the control group in improving the symptoms of pain tolerance ability (CD = 0.40, p < 0.01) [Table 2]. Thus, the yoga practices might have helped the college women to accept as well as adjust the pain that appears due to menstrual problems, which perhaps improved the pain tolerance ability among low fit college women (Rakhshaee, 2011; McCracken, 1998; Hayes et al., 1999; Benson & Frankel, 1978) [Figure 2]. Moreover, yoga might have worked as an alternative therapy and perhaps improved the mental health status (Peeke & Frishett, 2002) of the college women. This, in fact, suggests that yoga has a significant role in reducing the pain symptoms and/or improving pain tolerance ability among the college women during different phases of menstruation cycle. In case of pulse rate (beats/min), the result revealed that the mean scores (SD) in this variable of the low fit college women (who suffer from menstruation problems) in yoga group (pre: 1 and post: 2) and control group (pre: 3 and post: 4) were 81.89 (9.39), 74.88 (9.24), 83.43 (10.56), and 83.84 (10.43), respectively, which indicate that the baseline data on resting pulse rate of the participants with menstruation problem were higher [Table 1]. Appearance of such result in baseline data is found similar to several earlier studies, which indicate that women of reproductive age suffer from menses-associated hormonal as well as physiological changes and experience its associated health problems such as premenstrual symptoms, menstrual pain, and irregular menstrual cycles (Klein & Litt, 1981; Flug et al., 1984; Munster, Schmidt, & Helm, 1992). Thus, the baseline data as appeared in this investigation seem to be logical. 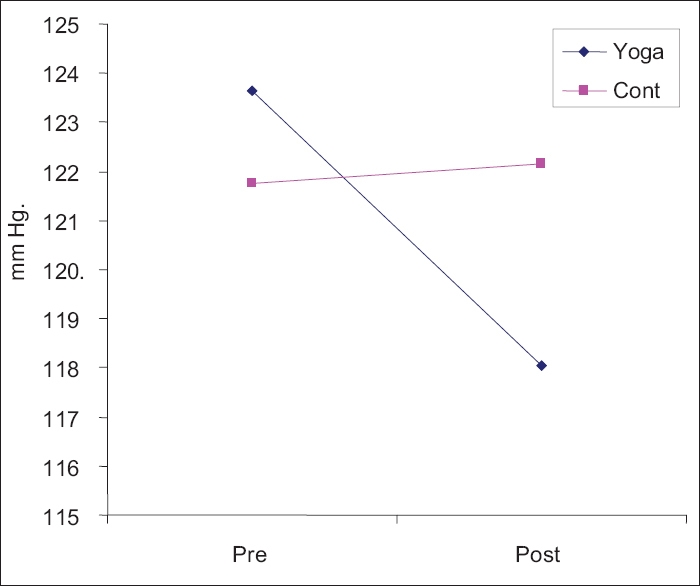 The result of factorial ANOVA followed by Scheffe's post hoc test further revealed that the yoga training could significantly bring down the resting pulse rate level within the normal range (CD = 0.68, p < 0.01), whereas the participants of controlled group could not reduce it statistically (CD = 0.15, p > 0.05) [Table 3]. 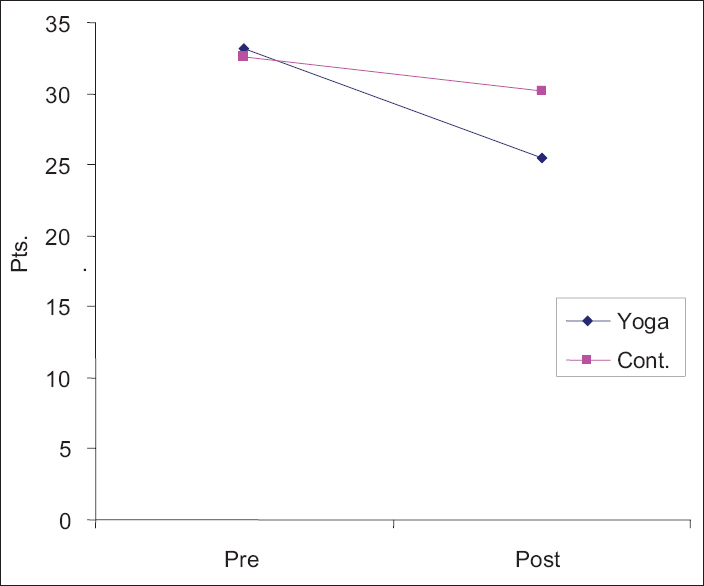 The result further infers that yoga group showed significant superiority over the control group in reducing pulse rate to the normal range (CD = 0.43, p < 0.05) [Figure 3]. Thus, the selected yoga practices might have worked as progressive stretching as well as relaxation (Goodale et al., 1990; Benson & Frankel, 1978; Lee et al., 2003), which could effectively reverse the pulse rate to the normal range in the low fit college women having menstruation problems. This, in fact, suggests that yoga helps in maintaining normal pulse rate level during menstruation period. Result on systolic blood pressure (mmHg) of the low fit college women (with menstruation problems) indicates that the mean scores (SD) of yoga group (pre: 1 and post: 2) and control group (pre: 3 and post: 4) were 122.74 (21.38), 118.48 (19.29), 120.50 (19.22), and 121.34 (20.17), respectively, which infer that the baseline data on resting systolic blood pressure of the participants with menstruation problem were higher [Table 1]. The result of Scheffe's post hoc test revealed that the yoga training could significantly bring down the resting systolic blood pressure level to the normal range (CD = 0.61, p < 0.01), whereas the participants of controlled group could not reduce the same (CD = 0.09, p > 0.05). 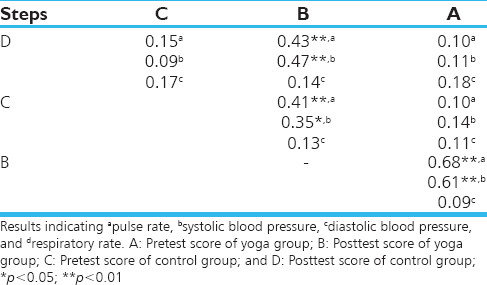 The results further deduce that yoga group showed significant superiority over the control group in lowering systolic blood pressure within the normal range (CD = 0.47, p < 0.01) [Table 3]. Thus, the progressive as well as relaxation aspects and diaphragmatic as well as abdominal breathing of yoga practices might have influenced the parasympathetic activities (Anand, 1991; Lee et al., 2003) that perhaps worked effectively to reverse the systolic blood pressure to the normal range of low fit college women having menstruation problems [Figure 4]. This, in fact, suggests that yoga significantly maintains normal range of systolic blood pressure during menstruation period. The mean scores (SD) in diastolic blood pressure (mmHg) of the low fit college women (with menstruation problems) in yoga group (pre: 1 and post: 2) and control group (pre: 3 and post: 4) were 77.07 (16.32), 75.71 (9.96), 77.20 (13.86), and 83.74 (19.35), respectively [Table 1], which indicate that the baseline data on diastolic blood pressure of the participants (with menstruation problems) remained at normal range. The result of Scheffe's post hoc test revealed no change in diastolic blood pressure in both yoga group (CD = 0.09, p > 0.05) and control group (CD = 0.15, p > 0.05). Further, intergroup comparison (yoga vs. control) also revealed similar trend of result, i.e., no difference in maintaining diastolic blood pressure (CD = 0.14, p > 0.05) [Table 3]. Thus, the selected yoga practices had no control over the diastolic blood pressure among low fit college women having menstruation problems [Figure 5]. The mechanism of such nonsignificant change in diastolic blood pressure is not clearly evident in the earlier research literature. Although both the groups showed normal range in diastolic blood pressure in baseline and posttest, appearance of such result, in turn, suggests that yoga had no significant effects for controlling diastolic blood pressure among the college women during menstruation period. Abplanalp, M. D., Livingston, L., Rose, R. M., & Sanwisch, D. (1977). Cortisol and growth hormone responses to psychological stress during the menstrual cycle. Psychosomatic Medicine, 39, 158-176. Allsworth, J. E., Clarke, J., Peipert, J. F., Hebert, M. R., Cooper, A., & Boardman, L. A. (2007). The influence of stress on the menstrual cycle among newly incarcerated women. Womens Health Issues, 17 ( 4), 202-209. American Alliance for Health, Physical Education, and Recreation. (1976). Youth Fitness Test Manual. Washington, DC: The Alliance. Anand, B. K. (1991). Yoga and medical sciences. Indian Journal of Physiology and Pharmacology, 35 ( 2), 84-87. Benson, H., & Frankel, F. H. (1978). Treatment of anxiety: A comparison of the usefulness of self-hypnosis and a meditational relaxation technique. An overview. Psychotherapy and Psychosomatics, 30, 229-242. Bera, T. K. (2004). Rating scale for menstrual profiles. Lonavla (India): Scientific Research Department, Kaivalyadhama SMYM Samiti. Bera, T. K. (2004a). Pain tolerance scale. Lonavla (India): Scientific Research Department, Kaivalyadhama SMYM Samiti. Cakir, M., Mungan, I., Karakas, T., Girisken, I., & Okten, A. (2007). Menstrual pattern and common menstrual disorders among university students in Turkey. Pediatrics International, 49 ( 6), 938-942. Carlson, L. E., Speca, M., Patel, K. D., & Goodey, E. (2004). Mindfulness-based stress reduction in relation to quality of life, mood, symptoms of stress and levels of cortisol, dehydroepiandrosterone sulphate (DHEAS) and melatonin in breast and prostate cancer outpatients. Psychoneuroendocrinology, 29, 448-478. Dell, D. L. (2004). Premenstrual syndrome, premenstrual dysphoric disorder, and premenstrual exacerbation of another disorder. Clinical Obstetrics and Gynecology, 47, 568-575. Flug, D., Largo, R. H., & Prader, A. (1984). Menstrual patterns in adolescent Swiss girls: A longitudinal study. Annals of Human Biology, 11, 495-508. Goodale, I. L., Domar, A. D., & Benson, H. (1990). Alleviation of premenstrual syndrome symptoms with the relaxation response. Obstetrics and Gynecology, 75 ( 4), 649-655. Harlow, S. D., & Ephross, S. A. (1995). Epidemiology of menstruation & its relevance to women's health. Epidemiologic Reviews, 17, 265-286. Hayes, S. C., Bissett, R. C., Korn, Z., Zettle, R., Rosenfarb, I., & Cooper, I., … Grundt, A. (1999). The impact of acceptance versus control rationales on pain tolerance. The Psychological Record, 49, 33-47. Johnson, S. R. (2004). Premenstrual syndrome, premenstrual dysphoric disorder, and beyond: A clinical primer for practitioners. Obstetrics and Gynecology, 104, 845-859. Kaplan, J. R., & Manuck, S. B. (2004). Ovarian dysfunction, stress, and disease: A primate continuum. ILAR J, 45, 89-115. Klein, J. R., & Litt, I. F. (1981). Epidemiology of adolescent dysmenorrhea. Pediatrics, 68, 661-664. Kuvalayananda, S. (1924). Asanas. Lonavla (India): Kaivalyadhama Ashram. Lee, J. S., Lee, M. S., Lee, J. Y., Cornelissen, G., Otsuka, K., & Halberg, F. (2003). Effects of diaphragmatic breathing on ambulatory blood pressure and heart rate. Biomedicine & Pharmacotherapy, 57, 87-91. Lee, L. K., Chen, P. C., Lee, K. K., & Kaur, J. (2006). Menstruation among adolescent girls in Malaysia: A cross-sectional school survey. Singapore Medical Journal, 47 ( 10), 874. McCracken, L. (1998). Learning to live with pain: Acceptance of pain predicts adjustment in persons with chronic pain. Pain, 74, 21-27. Munster, K., Schmidt, L., & Helm, P. (1992). Length and variation in the menstrual cycle – A cross-sectional study from a Danish county. British Journal of Obstetrics and Gynaecology, 99, 422-429. Peeke, P. M., & Frishett, S. (2002). The role of complementary and alternative therapies in women's mental health. Primary Care, 29 ( 1), 183-197. Rakhshaee, Z. (2011). Effect of three yoga poses (Cobra, Cat and Fish Poses) in women with primary dysmenorrhea: A randomized clinical trial. Journal of Pediatric and Adolescent Gynecology, 24 ( 4), 192-196. Rowland, A. S., Baird, D. D., Long, S., Wegienka, G., Harlow, S. D., & Alavanja, M., … Sandler, D. P. (2002). Influence of medical conditions and lifestyle factors on the menstrual cycle. Epidemiology, 13, 668-674. Solomon, C. G., Hu, F. B., Dunaif, A., Rich-Edwards, J. E., Stampfer, M. J., & Willett, W. C., … Manson, J. E. (2002). Menstrual cycle irregularity and risk for future cardiovascular disease. The Journal of Clinical Endocrinology and Metabolism, 87, 2013-2017. Solomon, C. G., Hu, F. B., Dunaif, A., Rich-Edwards, J., Willett, W. C., & Hunter, D. J., … Manson, J. E. (2001). Long or highly irregular menstrual cycles as a marker for risk of type 2 diabetes mellitus. The Journal of the American Medical Association, 286, 2421-2426. Teperi, J., & Rimpela, M. (1989). Menstrual pain, health and behaviour in girls. Social Science & Medicine, 29, 163-169.